summer eats | Top Shop Automotive Inc.
Can it be summer already? 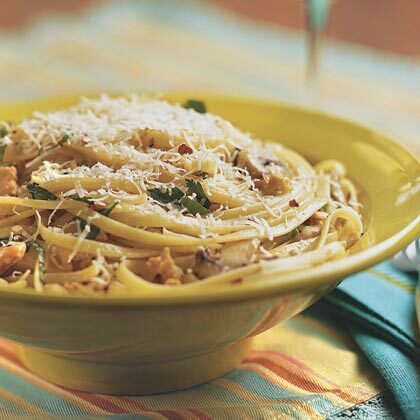 Maybe we’re not quite there yet, but we just couldn’t wait to break out one of warm-weather favorites: clam linguine. To get maximum oomph out of this recipe, pair with a bottle of white wine. We also suggest throwing a picnic blanket on the beach and slurping up this deliciousness while watching the sunset. Very romantic and very summer. Chop up garlic. In a large sauce pan heat 3 tablespoons olive oil and throw in chopped garlic and tin of anchovies. Cook until anchovies are dissolved in oil. Add half a bottle white wine to sauce mixture. At the same time, cook pasta separately in a large pan. Add 2 tablespoons butter and juice from clams to sauce. Add clams to sauce and cook for another two minutes. Drain pasta and add to pot of clams and sauce. Stir lightly, sprinkle a little Parmesan cheese, and enjoy! Visit our website at TopShopSB.com. This entry was posted in Recipe and tagged food, recipe, summer eats on May 7, 2013 by topshopauto.